/ BBQ / PGA WELLS FARGO, Stanley Cup & NBA Playoffs & Destin’s BEST TRADITIONAL BBQ Basket only $6.99! 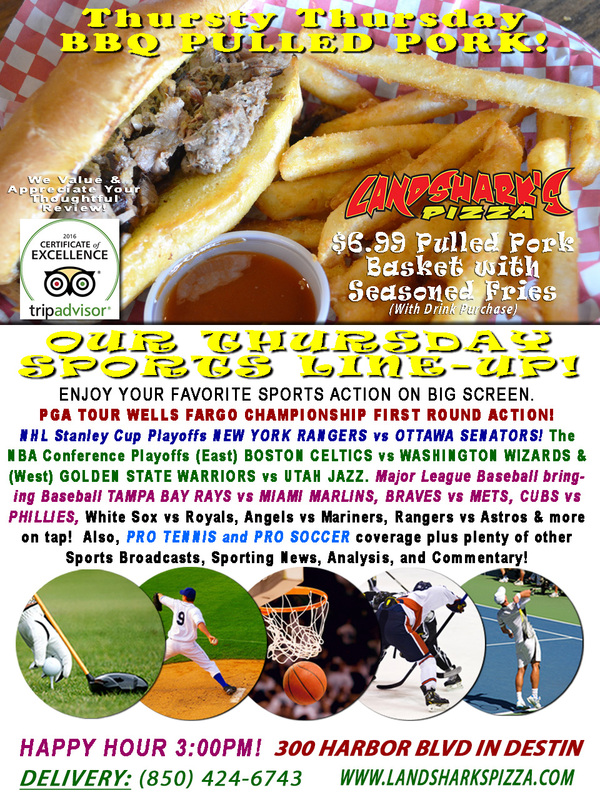 PGA WELLS FARGO, Stanley Cup & NBA Playoffs & Destin’s BEST TRADITIONAL BBQ Basket only $6.99! 1st Place Award-Winning BBQ: Slowly smoked, tender, juicy & delicious FALL-OFF-THE-BONE PULLED PORK basket with Succulent Seasoned Fries – Just $6.99 (dine-in with drink purchase)! 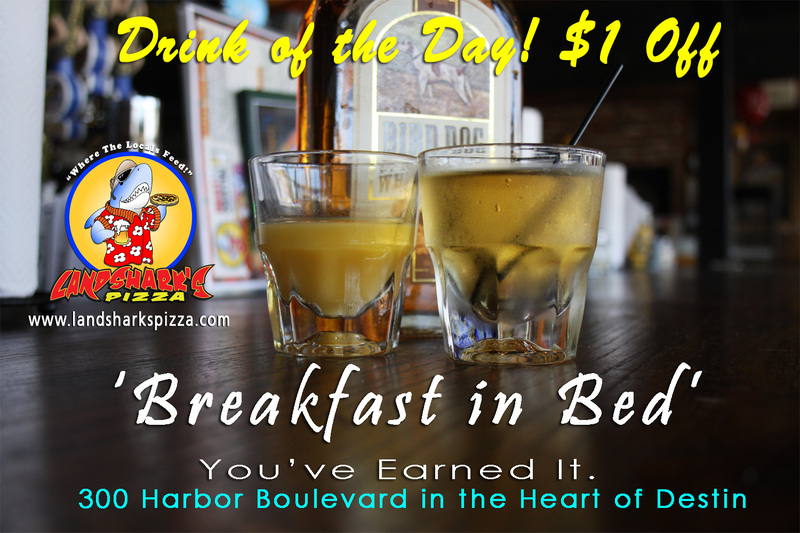 TODAY’S THE LANDSHARK’S DRINK OF THE DAY – Get treated right with your own ‘BREAKFAST IN BED’ Cocktail $1.00 OFF ALL DAY. FRIDAY: CINCO DE MAYO DRINK SPECIALS FRIDAY May 05th! …to kick off a fabulous weekend that includes THE KENTUCKY DERBY on Saturday – and yes, we’ll have your MINT JULEPS ice cold and ready for sippin’! 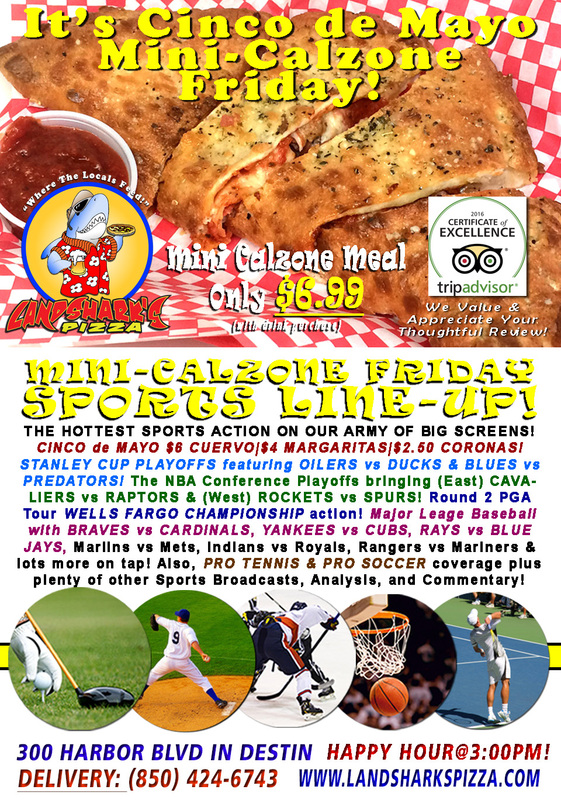 Friday’s also our 2-TOPPING CALZONE $6.99 dine-in special plus NBA & NHL PLAYOFFS! SATURDAY: 143rd RUNNING OF THE KENTUCKY DERBY with MINT JULEPS flowing all day and you can choose from among our FIFTY-SIX Bourbons (like FOUR ROSES, ANGEL’S ENVY, BLANTON’S & WOODFORD RESERVE) to get the taste you love most. Mint Juleps priced at whatever Bourbon you choose. SPORTS ON OUR ARMY OF BIG SCREENS – NHL Stanley Cup Playoffs featuring NEW YORK RANGERS vs OTTAWA SENATORS! NBA Conference Playoffs (West) GOLDEN STATE WARRIORS vs UTAH JAZZ & (East) BOSTON CELTICS vs WASHINGTON WIZARDS! PGA Tour WELLS FARGO CHAMPIONSHIP 1st Round. Major League Baseball TAMPA BAY RAYS vs MIAMI MARLINS, BRAVES vs METS, CUBS vs PHILLIES, White Sox vs Royals, Angels vs Mariners, Rangers vs Astros & more on tap! Also, PRO TENNIS and PRO SOCCER coverage plus plenty of other Sports Broadcasts, Sporting News, Analysis, and Commentary! NASCAR This Week: XFINITY Sparks Energy 300 (Sat. May 6th) & Monster Energy Cup GEICO 500 (Sun. May 7th) at Talladega Superspeedway! Pro Tennis This Week: ATP BMW Open (Munich), ATP TEB BNP Paribas Istanbul Open (Turkey), & ATP Millennium Estoril Open (Portugal) all May 1-7. PGA Tour This Week: Wells Fargo Championship at Eagle Point, NC. 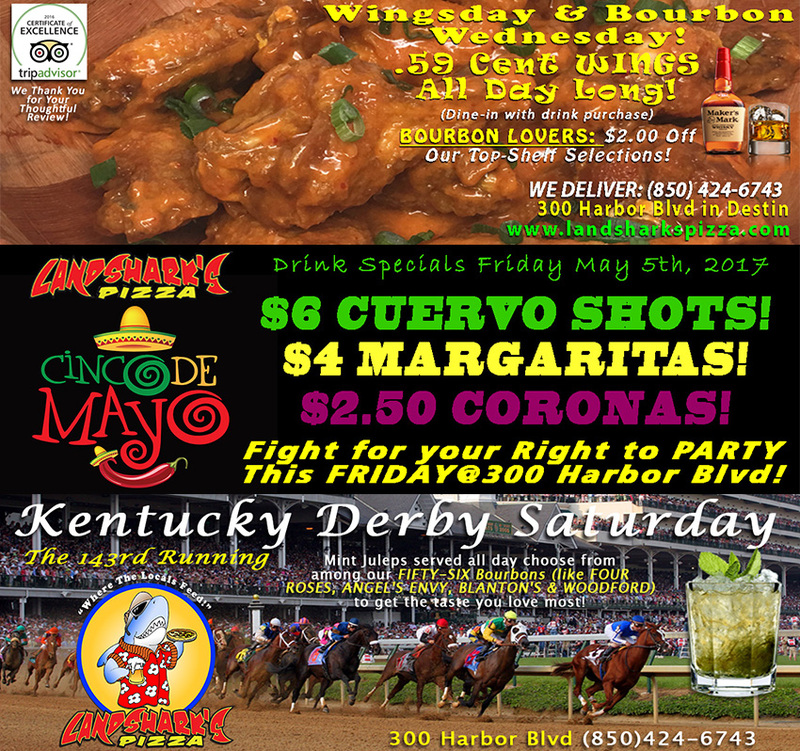 Previous Post: « Wing Wednesday, Cinco de Mayo & Kentucky Derby This Week!